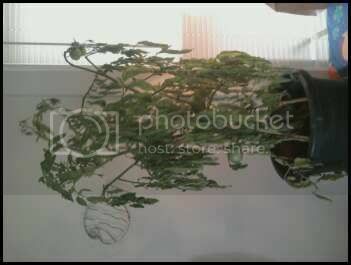 Can this tomato plant be saved? Is there anything I can do to help this plant produce the roots that were lost during the replanting quicker? or is it 'unsavable'? The parts of the plant that got the little root growth powder I had left are doing better. The leaves are all nearly gone because of yellowing and drying out. The pot is not holding water so I have been hand spraying the plant. Last edited by skaterprincess on Sun Sep 04, 2011 7:05 pm, edited 1 time in total. Your plant is suffering from transplant shock. Roots need to be treated very gently during the transplant process. Also, it's much harder on a plant if it is moved after it has flowered and set fruit. Plants should be settled in their final container well before they reach that point. It may drop some or all of the fruit as a result of being repotted this late. Covering the plant with clear plastic might have helped reduce the wilting, but it could also have lead to the growth of fungus. 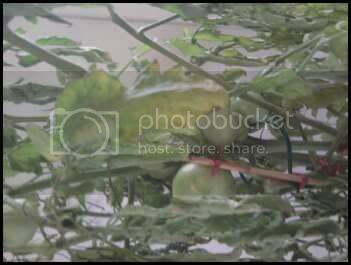 The wilted leaves and wrinkled tomatoes are the result of the feeder roots being unable to absorb enough water to maintain the rigidity of the cell walls. Why did you put milk on the roots? Was the plant showing symptoms of blossom-end rot? This is the first year that I have paid attention to what chemicals/fertilizer (or really food) that plants need. I added milk because I thought I remembered that it turns to nitrogen?? I really think I had my plants messed up - it's sweet peppers that like calcium. No need to feel embarrassed about a mistake. Everyone makes them. It's how we learn. If your plant hasn't perked up noticeably by now, the chances are strong that it isn't going to. Look at the posts at the very top of this section of the forum. There are several previous discussions that have been made into Stickies. 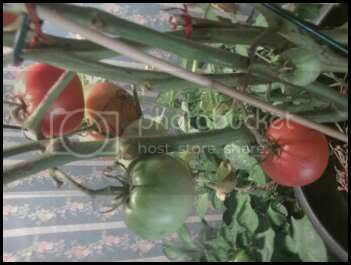 I think you will find a lot of excellent information about tomato gardening in those discussions. I haven't heard of milk as a source of nitrogen, but that doesn't mean it wouldn't be successful. I know milk is used as a fungicide and a source of calcium for plants, but for both purposes, I think it's usually mixed with water and sprayed on the leaves. All plants need calcium, btw. As you will learn when you read the Stickies, calcium is needed to prevent blossom-end rot, among other things. There is usually plenty of it in the soil, but for one reason or another, the roots can't absorb it. That's why spraying milk on the leaves can sometimes help. That wasn't the problem with your tomato plant, though. The other thing I am stuck on is part of the plant has come back but other parts of the plant have not. (It is a mutant as it was more than one plant to start with which after the fact I realized is why it was to top heavy for the original pot.) The part that looks like it is dying has fruit on it, does that affect anything? I was thinking about getting a plastic tub and let the plant sit it that for awhile to get the roots going?? This idea came from the suckers that I pulled and I did an experiment, the ones that just sat in water did just as well or better than the ones sitting in soil. Does anyone think this will work? 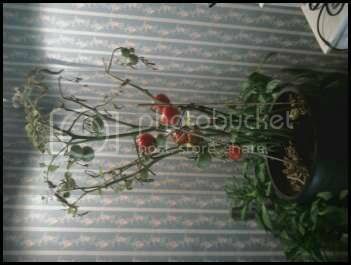 I wanted to give an interesting update on my poor sick tomato plant. Plants are amazing, they know just what to do. I think it is amazing that the fruit turned color! That was all I could ask for. I will pick the fruit, I am curious to see what the inside looks like. Once the fruit is picked, I am going to compose the rest - to bad I was hoping to experiment with it this winter inside. glad to see they have come around. As kisal said they don't like being transplanted with fruit and flowers. Next time do it earlier of if the situation arise and you can not. It may be best to remove flowers and fruit. This is done because the plant when transplant wants/needs to produce new roots. With fruit on it the plant is battling itself to to feed both the fruit and the root. 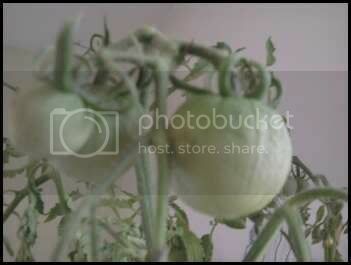 Can F1 Tomato Seeds Be Saved to Plant the Following Year? Tomato murder :( Can it be saved?